Our free broadcast services provide 24/7, (5 ) HD- mp3 pro digital CD quality net music radio stations via I-Net-Radio.com. (WRTRO) Retro 60’s And 70’s Radio, (WCXRK) Retro 70's Classic Rock Radio , (WKRTX ) Retro 80's & 90's Flashback Music Radio and the new ( WKRTX ) HD2 broadcasting in high definition audio. We also provide RSS valid - (WTLKW) M-Cities Real Talk Radio - Podcast radio, and print media over the net. All from an entertaining, informative, balanced and educated perspective. Music, News, Business, Entertainment and more. 24/7 .Timely business info tips, and more to keep you entertained, informed and up to speed for success in this fast paced global world that we live in. 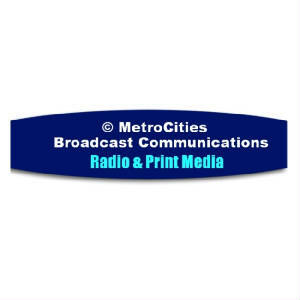 MetroCities Broadcast Communications and Print Media. To serve, inform and entertain 24/7. 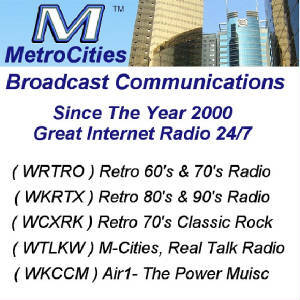 To listen our MetroCities radio group stations or view our print media websites. Click on the link above or at the top links selection of this web page.